I have hated broccoli all my life. Hated it. Now I love it! But only if I cook it. And only like this. Hmm. Does this count as a reformation? Ready? This is quick and easy. 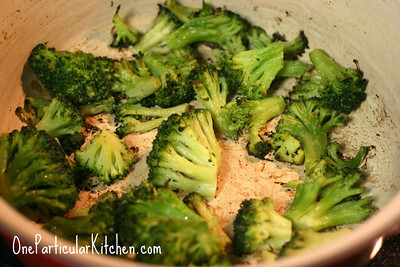 Now, quickly before it cools down at all, splash some lemon juice in the pan to deglaze it and un-stick the broccoli. It’s like magic, I’m telling you! Anything else? What do you use? I’m going to try this! 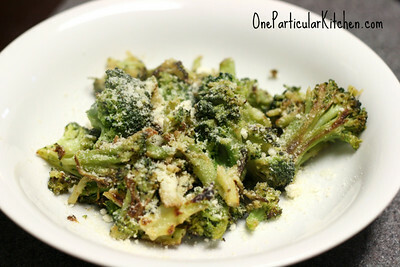 I’m a reluctant broccoli eater, but I bet this will be delish! We add toasted pine nuts to our roasted broccoli. Yummo! I find roasted veggies to be our fave way to prepare them… something about that slightly smoke flavor and crispy bits!